Poole, a third year from Rochester and SSHP president, was appointed to the Leadership Development Advisory Group. She hopes to expand her leadership skills, while working to develop ways to encourage fellow students to be leaders within ASHP. Reimer, a second year from Litchfield and SSHP president-elect, was appointed to the Policy and Legislative Advocacy Advisory Group. He believes advocating for his profession on a national level is vital as he works on his pharmacy career. He wants to take the advisory group knowledge and experience back to the SIUE SSHP to share with his fellow students. “I hope to educate students about the policy issues regarding pharmacy and the healthcare system, as well as the current pharmacy legislation from both the state and national levels,” Reimer said. “In addition, I hope to explore new possibilities to promote pharmacy students’ engagement in policy and legislation, so that we develop effective advocates for the profession of pharmacy in the future. The ASHP Pharmacy Student Forum has six advisory groups that provide advice and guidance to the Forum regarding the unique needs of student members, and how these needs might be addressed by the provision of resources and programs by ASHP. Learn more about the responsibilities of an advisory group member. 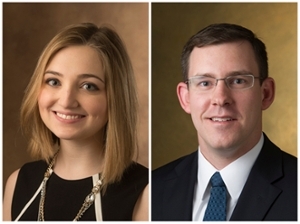 Photo (L-R): SIUE School of Pharmacy students Kaylee Poole and James Reimer.